Studio portrait of Australian Prisoner of War (POW) 3953 Sergeant (Sgt) Joseph Chandlot Clarence Whitbread, 13th Battalion, from Annandale, NSW, who enlisted on 30 August 1915 at the age of 21 and embarked for overseas on 20 December 1915 aboard HMAT Suevic. He was captured at Riencourt, France, on 11 April 1917 and held as a POW in Germany. He wrote from the POW Camp at Schneidemuhl, Germany on 13 February 1918 “We had a great concert last week, it was quite original – I wrote the piece myself and made all the costumes.” Sgt Whitbread was repatriated to England on 1 December 1918 and arrived back in Australia on 23 April 1919. One of a series of over 400 photographs sent by Australian POWs in German camps to Miss M. E. Chomley, Secretary, Prisoners Department, Australian-British Red Cross Society, London. Original album housed in AWM Research Centre at RC00864, Album image number 367. Outdoor portrait of two Prisoners of War (POW) at German POW Camp Schneidemuhl, Germany. 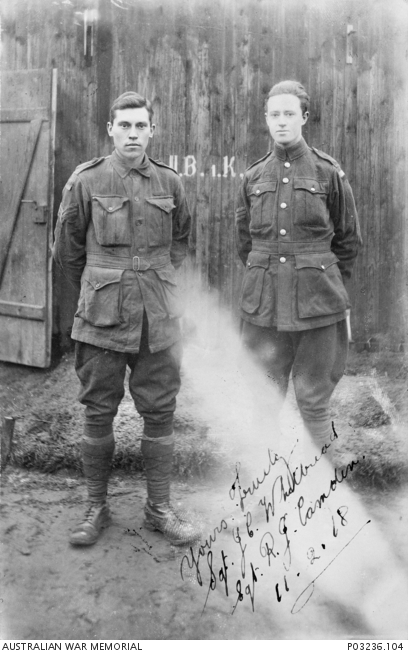 Identified on left is 112 Sgt Reginald James Camden, 11th Battalion, from Blackboy Hill Western Australia and on right is 3953 Sergeant (Sgt) Joesph Chandlot Clarence Whitbread, 13th Battalion from Annandale NSW. 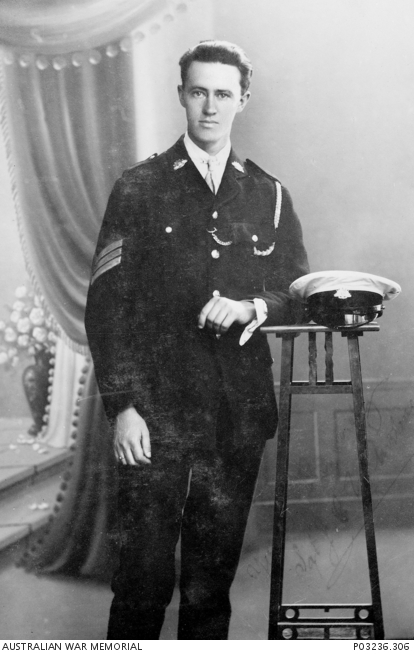 Sgt Camden enlisted on 21 September 1914 and embarked for overseas on 22 December 1914 aboard HMAT Themistocles. He was captured at Lagnicourt near Bullecourt, France on 15 April 1917 and held as a POW in Germany until he was repatriated to England in January 1919. He arrived back in Australia on 31 May 1919. Sgt Camden was awarded a Distinguished Conduct Medal (DCM) for conspicuous gallantry and devotion to duty during 22/25th July 1916 at Pozieres, France. Sgt Whitbread enlisted on 30 August 1915 and embarked for overseas on 20 December 1915 aboard HMAT Suevic. He was captured at Riencourt, France on 11 April 1917 and held as a POW in Germany. Writing from POW Camp Schneidemuhl on 13 February 1918 he reported “We had a great concert last week, it was quite original – I wrote the piece myself and made all the costumes.” Sgt Whitbread was repatriated to England on 1 December 1918 and arrived back in Australia on 23 April 1919. 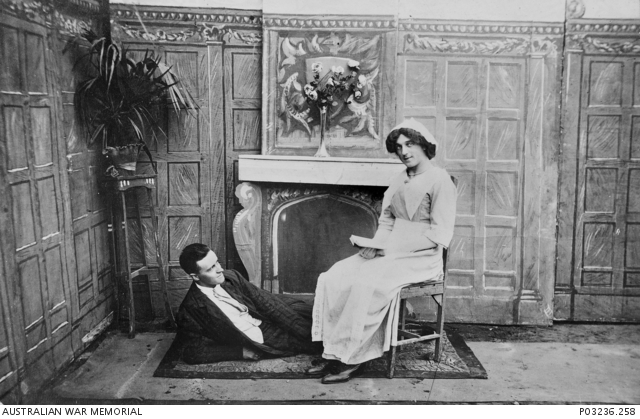 One of a series of over 400 photographs sent by Australian POWs in German camps to Miss M. E. Chomley, Secretary, Prisoners Department, Australian-British Red Cross Society, London. Original album housed in AWM Research Centre at RC00864, Album image number 133. 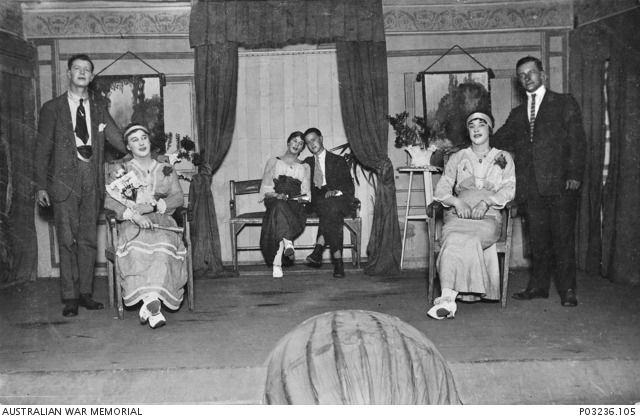 On-stage portrait of cast members of “Splash”, a play produced by Prisoners of War (POW) at German POW Camp Schneidemuhl, Germany. Identified from left to right is 3235 Corporal (Cpl) James Skelly, 55th Battalion, from Rockdale NSW; Alf E. Shaw; J. Short; 3953 Sergeant (Sgt) Joesph Chandlot Clarence Whitbread, 13th Battalion from Annandale NSW; David Ferguson; and Charles Cooper. Cpl Skelly enlisted at the age of 21 on 9 August 1915 and embarked for overseas on 30 December 1915 aboard HMAT Suevic. He was captured at Laventie, France on 20 July 1916 and held in POW camps in Germany until he was repatriated to Holland on 13 June 1918. He arrived in England on 22 November 1918. Cpl Skelly embarked to return to Australia on 5 March 1919 and was discharged on 20 June 1919. Sgt Whitbread enlisted on 30 August 1915 and embarked for overseas on 20 December 1915 aboard HMAT Suevic. He was captured at Riencourt, France on 11 April 1917 and held as a POW in Germany. He wrote from POW Camp Schneidemuhl on 13 February 1918 “We had a great concert last week, it was quite original – I wrote the piece myself and made all the costumes.” Sgt Whitbread was repatriated to England on 1 December 1918 and arrived back in Australia on 23 April 1919. One of a series of over 400 photographs sent by Australian POWs in German camps to Miss M. E. Chomley, Secretary, Prisoners Department, Australian-British Red Cross Society, London. Original album housed in AWM Research Centre at RC00864, Album image number 131.